ServerCentral Review 2019: Is ServerCentral a Good Hosting? 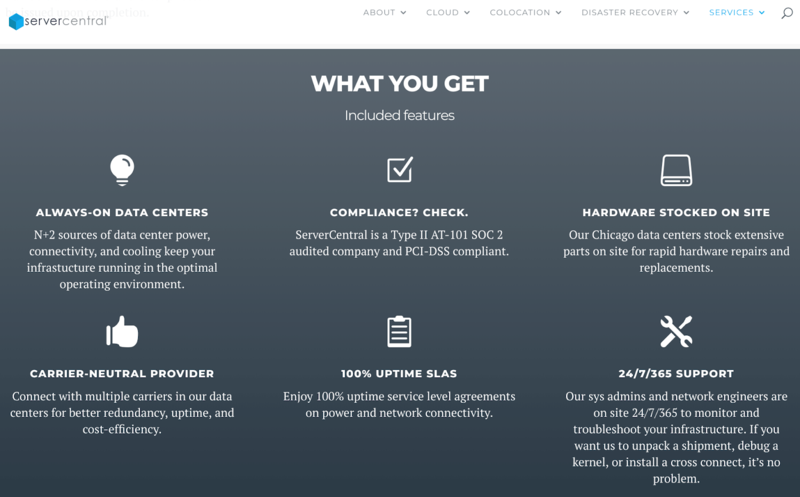 ServerCentral is a managed IT infrastructure provider based in Chicago, Illinois. Since its inception in 1999, the company has been providing cloud solutions, colocation, managed services, and data recovery services to businesses of all sizes in the United States and many other countries including India, Brazil, Turkey, and Canada. ServerCentral is a leading American provider of managed data center solutions. The company was established in 1999 and its headquarters are in Chicago, Illinois. They offer cloud solutions, colocation, managed services, and data recovery services to businesses of all sizes in India, Brazil, Turkey, Canada, and other countries around the world. ServerCentral provides the aforementioned managed IT infrastructure solutions, colocation services, virtualization, dedicated servers, and cloud services. They don’t offer VPS or shared hosting solutions. ServerCentral’s hosting servers are housed in their main data centers located in the U.S., the U.K., the Netherlands, Japan, and Australia. Their colocation and dedicated servers are offered at Equinix data centers. To guard against power failure, all these data centers are equipped with N+1 redundant UPS systems and have a diesel generator that can maintain power for up to 36 hours. ServerCentral offers a fully managed DRaaS solution to provide automated failover for virtualized infrastructure, and they give clients the ability to use any cloud platform or infrastructure as a restore point for their data, servers and applications. ServerCentral utilizes a redundant fiber optic network that connects their diverse networks, and they have diversified their network by peering with major local networks. ServerCentral’s colocation and disaster recovery services are PCI DSS compliant, but they have yet to expand their PCI DSS coverage to their hybrid cloud, private cloud, and dedicated server solutions. ServerCentral offers advanced colocation solutions that include power services, colocation space services, media conversion services, and cross-connect services. Entrepreneurs with large, busy, and complex websites will be pleased to know that this vendor allows them to operate several servers simultaneously for additional power and redundancy. ServerCentral does not include a control panel with any of its plans, so customers who require this will either have to use another hosting provider or conjure up their own control panel. This company also seems to struggle with upgrading from one plan to another. The process has not (yet) been streamlined, so users often find it takes a little longer to upgrade with them than with their competitors. On the plus side, it is extremely rare to hear customers complain about the integrity and robustness of this vendor’s hosting solutions once the upgrade is complete. ServerCentral’s prices are quite expensive and may strain the budgets of many small businesses. But for bigger businesses that can afford to spend a little more on hosting solutions, this vendor is cut above the rest. All their feature-packed plans can be subscribed to on short monthly contracts. The company offers a 100% uptime guarantee, but there is no compensation plan and no money-back guarantee for new customers. You can contact ServerCentral’s responsive, polite and helpful 24/7 support team using their toll-free telephone number or via email. You can also connect with them on their social media channels or open a support ticket, but this vendor does not have a live chat. They do have a knowledge base with a blog that is packed with informative tutorials for users who prefer to support themselves. If you’re looking for cheap hosting services, ServerCentral would be an unsuitable solution for you. But if you’re more interested in quality than sheer cost, ServerCentral could have exactly right hosting solution for you. Wondering how ServerCentral stacks up against other Web Hosting companies? Enter any other Web Hosting company and we will give you a side-by-side comparison.